Former Tate Publishing Author, Heather D. Nelson, Reclaims Creative Property with Release of New Book, "Hail Mary for Peanut"
While more than 2,000 consumers have registered complaints with the Oklahoma AG Office, most of which are still waiting to receive their files back, Nelson decided to take matters into her own hands. “At the end of the day, I had to let go of the anger against Tate Publishing and just get on with the business of writing.” This latest book, "Hail Mary for Peanut" shares all the raw ups and downs of the personal journey, while infusing each chapter with wit, wisdom, and genuine concern for others. ​Heather D. Nelson was originally published in 2009 in the field of Infertility and Pregnancy Loss. Since that time, she has had a string of columnist positions and even some freelance Op-Ed opportunities. Her life has evolved over the years and now she actively blogs on everything from homeschooling, writing, and advocating for her Type 1 Diabetic son. 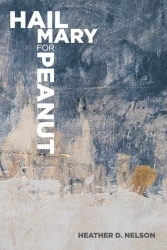 ​This latest book, "Hail Mary for Peanut" is a return to her first love. "Hail Mary for Peanut" is the emotional story of one couples journey to parenthood when they realized God had other plans for them. The author shares all the raw ups and downs of her own personal journey, while infusing each chapter with wit, wisdom, and genuine concern for others. Included is a section of practical tips for couples coping with the stress of infertility and pregnancy loss. There’s even a bonus section which holds priceless advice for friends and family members. This book is timely for any couple of faith encountering struggles in their family planning making this a perfect one-stop-shop for support and encouragement. The book is available now in paperback on Amazon and Kindle has the pre-order launch date for September 1st, 2018.